ECR Lab. Failure Analysis. MIL-STD, Environmental, Electrical Testing. Destructive Physical Analaysis (DPA). Components Upscreening. - ECR Lab. Electronic & Analytical Lab. 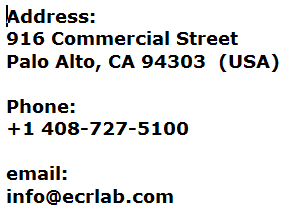 ECR Laboratory, Inc. is an independent testing electronic and analytical lab located in Palo Alto (USA), in the heart of Silicon Valley. ECR Laboratory, Inc. has been issued laboratory suitability by the Defense Logistics Agency (DLA) Sourcing and Qualification (VQ) to perform MIL-STD tests in accordance with the requirements of military specification MIL-PRF-38535. ECR Laboratory, Inc. has been granted approval to perform Devices screening and Destructive Physical Analysis (DPA) on all EEE parts for use on the NASA International Space Station (ISS) Program. Since 1983 we have been providing independent services with no association or affiliation with any other company. We work in full compliance with current industry testing standards, like MIL-STD-202, MIL-STD-883, MIL-STD-750, MIL-STD-1580, EEE-INST-002, PEM-INST-001, SSQ25000, SSQ25001, GSFC-S-311-M-70, JEDEC, EIA/JES or any other applicable standard. We also perform analyses in accordance with customer’s specification. Failure analysis of semiconductor devices, electronic devices, printed circuit boards (PCB). Destructive physical analysis (DPA) and construction analysis of electronic devices according to MIL-STD-1580, SSQ25000, PEM-INST-001, ANSI/EIA-469, GSFC-S-311-M-70, or any other applicable standard. Detection and Analysis of counterfeit electronic components. Semiconductor devices de-processing, package de-capsulation. Cross-Sectioning, parallel and angle lapping. Radiographic (xray) inspection and imaging of electronic devices. Scanning Electron Microscope (SEM) inspection/analysis. Upgrade Screening and Qualification Testing of electronic devices. Confocal Scanning Acoustic Microscopy (C-SAM) for the nondestructive analysis and image acquisition of internal features, including defects such as cracks, delaminations and voids. Energy-dispersive X-ray spectroscopy (EDS, EDX or EDAX) and X-ray fluorescence (XRF) spectrometry for the elemental analysis or chemical characterization of materials and Prohibited materials Analysis. Auger Electron Spectroscopy (AES) for surface analysis. Electrical characterization and measurements of electronic devices (dc, ac, impedance, s-parameters, 1/f noise, thermal noise) in a wide range of temperatures on wafer or packaged parts. Time domain reflectometry (TDR) for the electrical characterization of IC packages, printed circuit boards (according to IPC-TM-650), connectors, inter-connections, cables. (inductors, capacitors, resistors), custom made macro-models (sub circuits).